I have a lovely friend. I have many lovely friends, but this one in particular happens to work at a boutique hotel in Sydney's rocks area. The oldest part of Sydney, right on the Harbour where the first colonies were established. Because she is such a lovely person, guests who stay in the hotel often leave her little thank yous, like curling wands, $30 tips and gift vouchers for fishy dinners. Yep fishy dinners. She had been holding onto a $100 gift voucher for dinner at a restaurant called Fish at the Rocks since the beginning of the year. The two of us finally cashed in on it the other week and got all dressed up for a fishy date. Dates with close friends are great. There is no real expectation, you are not nervous about how you look, if they will like you, what you are going to talk about or where it all may lead. I think dates should always be with close friends. They are so much fun! However, as usual I completely forgot to take any pictures of the evening. Sorry guys. There are a couple of my walk through the park but that's it. I did draw an amazing (inject sarcasm) picture of my friend whilst at my desk at work using pen and my two highlighters. Here tis. Her bun wasn't actually on the side. It's just the way my work brain captured it. Apologies again. Imagine people. It's good for you. So... on to the evening... Note: This is a LOOOONG post. Please feel free to opt out now if you do not have the patience. I left work and walked through Hyde Park in the magnificent afternoon sun down to the Opera House to meet my friend. She was all peachy, dressed in a lovely vintage frock, sitting in the sun. 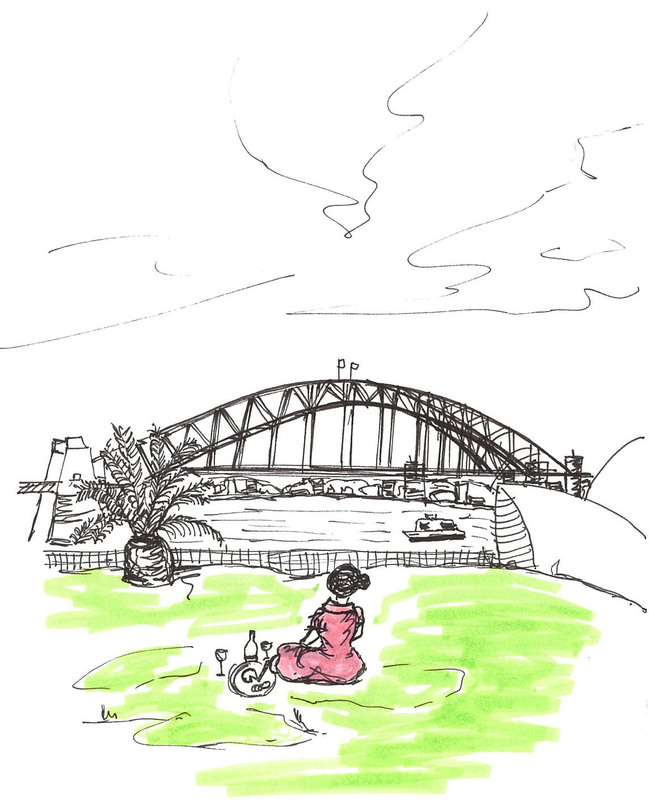 Our reservation wasn't until later in the evening so we sat on the grass just outside Government House drinking champagne, enjoying some cheese and quince paste and gazing at the Harbour Bridge. Very civilised She even came prepared with glasses for the champagne. No plastic cups for us! We perused the menu and made a plan of action to ensure we got the most out of this $100. We decided that we would share a main and a dessert and order an entree each - again to share. Then we discovered the entree platter for two which was the same price as two entrees but allowed you to sample 4 in a "tasting size". Perfect. Done! As the sun was setting we made our way over to the restaurant which was in a part of the rocks I have never been to. Over the back, behind all the tourist shops. I don't know how that is possible having lived in Sydney for over 10 years, but it clearly is It was Halloween and although Australia doesn't really celebrate Halloween there were a few groups of people dressed in costume ready to depart on the local ghost tours. The rocks area is full of ghost stories with many of the old buildings there claiming their own ghost or spooky occurrence. Now to the food details. As mentioned we started off with the entree platter for two, a choice of 4 entrees "tasting size". We chose the Atlantic Salmon Gravlax with roesti potato, zucchini pancake, basil oil, creme fraiche and salmon cavair. My friend was disappointed and thought gravalx was going to be something amazing and not the packet smoked salmony normalness she found rolling around her tongue. Me? I was still reeling after the Bloody Mary Vodka shot with oyster that very nicely warmed my lips, tongue and throat. I mentioned oyster right? What oyster? Mine went straight down with the liquid chili. My friend sat there and chewed hers. errrg. We also tried the Croquette of Alaskan king crab and dutch cream potatoes with aoli, rocket and tomato kasundi. It was the best choice by far. YUM. For main we shared the Whole Baked Barramundi. It sounded impressive. A WHOLE fish, baked on our plate. A little unnerving, but definitely impressive. The waitress however delivered it split into two serves (as we were sharing) and so the effect didn't really come off. Never-the-less it was delicious. De-boned and stuffed with diced prawns and vegetables, drowned in red coconut curry (can you drown a fish?) and served with fried sushi rice balls. I let my friend choose the dessert, which was an Affogato made with an extra shot of frangelico - in order to wake us up a little from the wine, so we could go and indulge in more wine. Nice one! When we were finished we requested the bill. Inside was a survey asking us to rate the restaurant and give suggestions etc etc. After suggesting the decor could do with some carefully placed ice sculptures accompanied by the subtle the sounds of dolphins, we departed into the night and hit the streets of the rocks. It starts to get a little sketchy here guys. Perhaps I shouldn't post about it but what the hell, I am gonna... We enjoyed a couple more drinks at a hotel that I can't remember the name of, where we met a guy that I can't remember the name of, from somewhere in the States that I can't quite recall. He was dressed as a nun with a hole in the back of his habit and a fake plastic bum. Despite the costume, he was quite pleasant to talk to. It was around midnight when most of the pubs were closing that we decided to catch a bus back into our hood - The Inner West. I may or may not have had a little nap on that trip. Who knows. Being a mum with a small bird child my mornings start at 5am . I am allowed a maybe nap at midnight. We landed in Newtown and quickly entered the Townie. Yep the Townie. If you live in the inner west that's where most BIG nights end, if not at the Sly Fox. It was full of Halloweeners. Even those not participating in Halloween were accused. Well, In my defense he was dressed like Hunter S Thompson sporting boat shoes, Hawaiian short sleeve shirt, short shorts, clutching a book and standing in a crowd of Halloweeners! Turns out he was just a hipster. pffft. The night rolled on until almost 3am! When I drew the line (we/my friend ran out of money) and we walked home together.